27 EU member states were no less principled than members of the House of Commons. At a meeting of the European Council, EU heads of government refused to make concessions, to amend the already agreed text.A few days before this, Teresa May had vainly hoped that the House of Commons would accept the conditions contained in the draft version of the EU-Brexit agreement with Britain. However, having felt something was wrong, the British Prime Minister canceled the voting in parliament, for which the opponents from her own Conservative Party decided to punish May with a no-confidence vote. 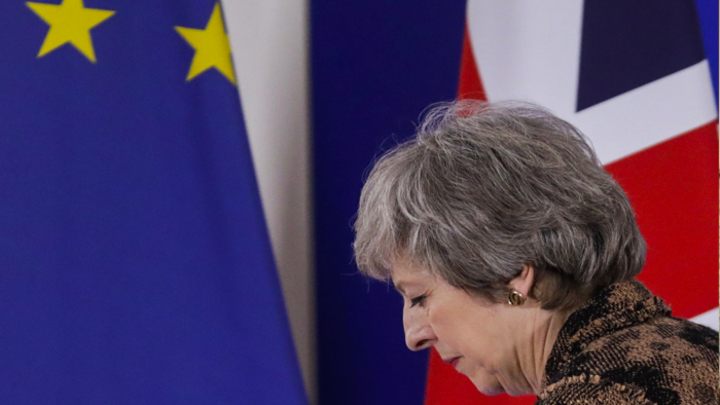 But the impeachment of the Prime Minister did not take place, 200 out of 317 Tory deputies supported their leader.The problem that May is "fighting" with her party members in Britain is the 500-page Brexit agreement signed by the EU foreign ministers on November 13. The main point that causes controversy is the question of the Northern Ireland border. Brussels does not want to allow the creation of a “hard border” between Northern Ireland (part of the United Kingdom) and Ireland after Britain’s withdrawal from the European Union. Therefore, in accordance with the agreement, Northern Ireland remains in the single European market until London and Brussels agree on what the border will look like after Brexit. For a transitional period, in the absence of agreements, Northern Ireland will become a special zone, being in a customs union with both the EU and the United Kingdom. The British will have to control the flow of goods across the sea from Northern Ireland. At the summit in Brussels, May wanted to get clear guarantees that when the UK leaves the customs union with the EU, Northern Ireland will come out of it. The rest of the EU member states want to slow down the process of Northern Ireland exit (back stop). In a word, in the absence of guarantees from the EU, Great Britain can lose control over Ulster after it leaves the European Union. This threat provokes the anger of the conservatives, who consider the agreement with the EU actually a "betrayal." Brexit Affairs Minister Dominic Raab, retiring, said he made this decision because a deal with the EU threatens the territorial integrity of the United Kingdom. The resignation took place two days after the signing of the draft contract. Under British law, Teresa May can re-face a vote of no confidence only after a year. Formally, no one can shift it for lack of rigidity in negotiations with the EU. But by January 21, a second vote on the deal should take place in the House of Commons, the result of which is unlikely to satisfy the Prime Minister. When parliamentarians reject the Brexit agreement, May will have no choice but to retire voluntarily. This is much better than turning into a “soccer ball”, which will be constantly driven either to Brussels or to the House of Commons.